Not to be confused with Women's Rugby League. Women's rugby union is a sport identical to men's rugby union with the same rules, same sized pitch, and same equipment. However, it has a history which is significantly different, due to various social pressures, and the self-image of rugby union in general. As a result, this history has been largely hidden until comparatively recently, although the game is gaining a higher profile thanks to international tournaments and financial investment. The secretive nature of the early years of women’s sport—and especially rugby union—ensures that we do not really know where it began. Public reaction to women playing contact sports could be disrespectful, or even violent. In 1881, when two teams played a number of exhibition "football" games in Scotland and northern England, several games had to be abandoned due to rioting in or around the grounds. While most of these games appear to have been played to the new Association Football rules, it is clear from reports in the Liverpool Mercury of 27 June 1881 that at least one of these games, played at the Cattle Market Inn Athletic Grounds, Stanley, Liverpool on the 25th, involved scoring goals following "touchdowns" and may therefore have been played to at least a version of rugby rules. Whether this was the case is unknown. 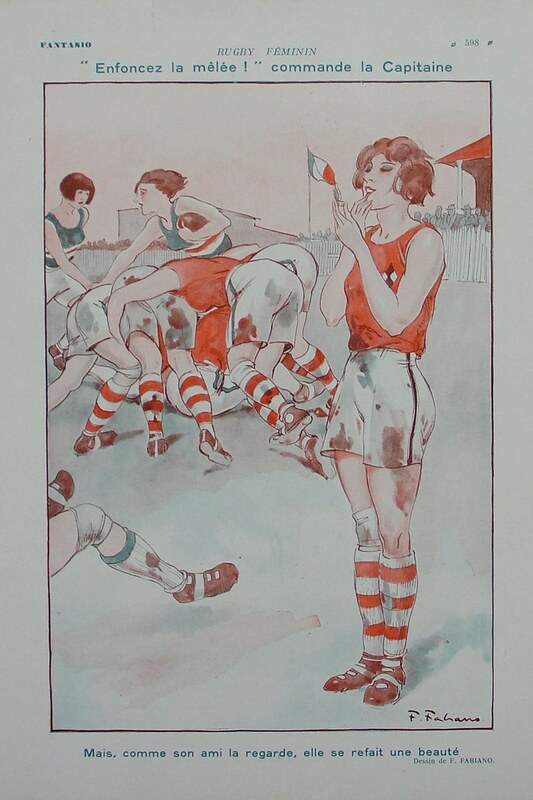 However, a series of sporting cigarette cards, published 1895 in the Liverpool, includes an image of a woman apparently playing what looks like rugby in kit very similar to that described in reports of the 1881 team (see left). It is therefore possible that these "exhibition" games similar to those in 1881 may have continued (with no press reporting) or the pictures may have been reprints for earlier illustrations inspired by the 1881 games, or they may just be an "amusing" cartoon or an illustration of a sport that was not actually being played. Again no further details are available. Other than this the official record is silent for most of the nineteenth century. Some girls played the game unofficially as part of their school teams—and the earliest confirmed record of any female definitely playing rugby at any level anywhere in the world comes from a school game. This happened at Portora Royal School in Enniskillen, Northern Ireland. Emily Valentine's brothers were responsible for the formation of the school's first rugby team in c1884. Emily practised with the team and in c1887 she played for the school, scoring a try. The first documented evidence of an attempt to form a purely women's team is from 1891 when a tour of New Zealand by a team of female rugby players was cancelled due to a public outcry. There are also early reports of women’s rugby union being played in France (1903) and England (1913) but in both cases the game was largely behind closed doors. During the First World War some women's charity games were organised, the most well documented taking place at Cardiff Arms Park on 16 December 1917, when Cardiff Ladies beat Newport Ladies 6–0. Maria Eley played full-back for Cardiff and went on to become probably the oldest women's rugby player before she died in Cardiff in 2007 at the age of 106. The Cardiff team (who all worked for Hancocks a local brewery) all wore protective headgear, which predates their male counterparts by some decades. Women's rugby union team, New South Wales, Australia, 1930s. 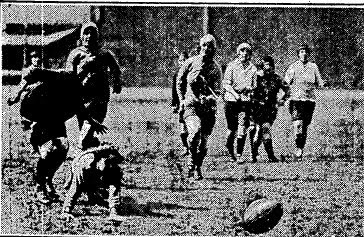 In Sydney in 1921, two women's teams played a game of rugby league in front a crowd of 30,000—a photograph appeared in The Times in 1922—but pressure from authorities ensured that they did not play again. Throughout the 1920s a popular form of women's football game very similar to rugby called "barette" was played across France. The game had only minor differences to the full game (games were 10-a-side and had some minor restrictions on tackling) and there were national championships throughout the decade. It received support from several male rugby players and film also exists of a game being played in 1928. Both barette and the full game of rugby featured in several newspaper cartoons and many photographs exist. For reasons unknown the game appears to fade away in the 1930s. In 1930 a women's league playing the full game was formed in Australia, in the New South Wales areas of Tamworth and Armidale, which ran until halted by World War Two. Photographs of women's teams also exist from New Zealand from the same period and during the war Maori women took up the game. After the war in 1956 The Belles of St Mary’s—an Australian women's rugby league team—played games in New South Wales—but even as late as the 1960s Women's rugby was banned in Samoa. The 1960s was the decade in which the game finally began to put down roots, initially in the universities of Western Europe. In 1962 the first recorded UK women's rugby union team appears at Edinburgh University, in 1963 female students participate in matches against male students in London, and in 1965 university sides are being formed in France. As the pioneering students left university an adult game began to evolve. Initially (1966) this tended to be confined to charity matches between male and female teams (especially at Worthing RFC, England), though the UK's Daily Herald newspaper includes photographs of girls' teams training in Thornhill, near Dewsbury in Yorkshire in 1965, and at Tadley in Hampshire in 1966—and appealing for fixtures. It is not recorded whether these teams did arrange any games, and so it is not until 1 May 1968 that the first fully documented and recorded women's club match takes place, in France, at Toulouse Fémina Sports in front of "thousands of spectators". The success of the event lead to the formation of the first national association for women's rugby union—the Association Francaise de Rugby Feminin (AFRF) at Toulouse, in 1970. 1970 also saw the first reports of women's rugby union in Canada, and by 1972 four universities in the United States were playing the game: University of Colorado, Colorado State University, the University of Illinois and the University of Missouri. By 1975 university students at Wageningen in the Netherlands were playing, and in the same year clubs appeared in Spain (Arquitectura in Madrid and Osas in Barcelona). The first non-university clubs formed in 1978 in Canada and Netherlands, and in Italy (Milan) a year later. By 1980 there were club championships in the United States and Sweden, and provincial championships in New Zealand. The game first appeared in Japan in 1981 and in February 1982 University College, London's women's team went on a tour to France playing, amongst other teams, Pontoise—the first recorded overseas tour by a UK team (and possibly the first international tour by any team). A few months later on 13 June 1982 the first women's international—Netherlands 0, France 4—took place at Utrecht (see Women's international rugby union for more details on the history of the international game). In the UK 1983 saw the Women’s Rugby Football Union (WRFU) formed to govern the game across the British Isles. Founder member clubs are: Leicester Polytechnic, Sheffield University, University College London, University of Keele, Warwick University, Imperial College, Leeds University, Magor Maidens, York University and Loughborough University. 1988 Women's International Rugby Board (WIRB) formed. 1990 also saw the first international tournament—RugbyFest held in Christchurch, New Zealand. As well as a variety of club sides, including teams from Japan (but not the Japanese national team), were four "national" teams—USA, New Zealand, USSR, and the Netherlands—who played a round-robin tournament. The winner was New Zealand, who then played—and beat—a combined "World XV". Rugbyfest 1990 pointed the way to the next big leap forward—the first women's rugby world cup, which took place in Wales the following year. Timed to coincide with the second men's world cup being held in England it did not meet with official approval from World Rugby (then known as the International Rugby Football Board), a decision which threatened the competition and was a factor in the New Zealand RFU not supporting their entry. However, this did not stop the New Zealanders from taking part—nor Wales, the United States, England, France, Canada, Sweden, USSR, Japan, Spain, Italy, and the Netherlands. The competition was run on a shoestring. Russian players sold souvenirs before and during matches to raise funds to cover their expenses, while four England administrators re-mortgaged their houses to cover the expenses of attending the competition. But after fifteen matches the first world champions were crowned—the United States, who beat England in the final. Despite the lack of support from the men's game, and very little media coverage, the competition had been a success, and the women's game continued to grow. 1993 Scottish women split from the WRFU to be governed by their own Union (the Scottish Women’s Rugby Union). 1994 The WRFU disband. The Rugby Football Union for Women (RFUW) is formed in England, while the Welsh Women’s Rugby Union affiliates with the Welsh Rugby Union. In 1994 a second world cup was awarded to the Netherlands, but constant prevarication by the IRFB about whether they would (or would not) give the tournament official status caused huge problems for the hosts. Without IRFB support there was a fear that many unions would not send teams which would threaten the tournament (and even the Dutch union's) viability. In fact the IRFB went so far as to threaten sanctions against any unions did take part—thus ensuring that New Zealand, Sweden and Germany withdrew. Faced with this the risk of major losses was as too great and the Dutch withdrew both as hosts and participants with barely weeks to go. It was Scotland who stepped in to save the event with only 90 days to organise it. The second world cup was in the end a purely northern hemisphere affair with 11 remaining teams (consisting of the four home nations, France, the United States, Japan, Sweden, Russia, Canada and Kazakhstan) joined by a Scottish Students XV. The final was a repeat of 1991, but with this time England overcoming the United States 38–23, the final being played at Raeburn Place, Edinburgh. Despite everything, the tournament had been a success, and the game continued to grow. 1996 First Home Nations competition held between England, Ireland, Scotland and Wales. Won by England. 1998 New Zealand drop the nickname "Gal Blacks" to become the "Black Ferns"—the female version of the "silver fern" used by the male team. 1998 The 1998 Women's Rugby World Cup is the first Women’s Rugby World Cup to be fully sanctioned by the newly-renamed International Rugby Board, now World Rugby. Widespread acceptance of the game led to women's versions of other major rugby union tournaments (the women's Five Nations begins in 1999), and growing numbers of headlines. In 2000 the Irish WRFU affiliated fully with the IRFU—but there were still set-backs. In 2002 the Australian RFU dropped support for the women's team's entry to the World Cup. The decision was seen as a factor in IOC rejection of rugby as an Olympic sport, and was reversed two years later. But this was unusual. Women's teams were now being accepted on the main stage. In 2002 Scotland played their first women’s match at Murrayfield and in 2003 England staged the first women’s international at Twickenham. In 2006 the RFU devoted the rugby museum's main annual exhibition to the history of women's rugby—"Women's Rugby—A Work in Progress", and the same year saw the Women's Rugby World Cup broadcast live on the internet. The growth in popularity among women attracted women in both developed and emerging nations, being the fastest growing sport in the world. The participation rates in both rugby sevens and rugby unions (with 15 players) has close to 500,000 new players joining every year globally. According to World Rugby, women's rugby is growing faster (if not as fast) as men's rugby and it is estimated that by 2026 40% of the total number of rugby players will be female. The game remains an amateur, minority sport—but a fast-growing one played in over 80 countries worldwide. Cost and player numbers mean that, in many of these nations, sevens tends to dominate, but 15-a-side championships have now been established in all regions. The Women's Home Nations Championship becomes the Women's Five Nations with the addition of France. South African women affiliate with South African Rugby Football Union. The addition of Spain establishes the Women's Six Nations. 2002 Australian RFU drops support for women's team's entry to world cup. Decision seen as a factor in IOC rejection of rugby as an Olympic sport. Reversed two years later. 2004 Wales restrict national team selections to players from Welsh teams. Slump in performance significant factor in rejection of entry for 2006 World Cup. Decision reversed in time for 2006 Six Nations. Canada controversially selected as hosts for 2006 World Cup—despite major bid from England. Believed that selection was part of an IRB policy to host tournaments outside of Europe. Ugandan women form Uganda Women's Rugby Association (UWRA) and affiliate to the Uganda Rugby Union (URU). The inaugural Confederation of African Rugby (CAR) women's 7s. Uganda are the hosts and lose to South Africa in the final. New Zealand's Black Ferns defeat England in the IRB's Rugby World Cup Women's Final in Canada. Donna Kennedy becomes Scotland's most-capped player and the World's most-capped female player with 100 caps. Her last game a narrow defeat to France. This record has now been overtaken by Louise Rickard of Wales, who equalled Kennedy's record in the 2008 6 Nations. Welsh Women's Rugby Union merges with the Welsh Rugby Union. The Women's Six Nations is formally adopted by the men's Six Nations organisation; as a result, Spain are replaced by Italy. Australia take the title at the inaugural IRB Women's Rugby World Cup Sevens in Dubai, which was fully integrated into the men's competition. Australia beat New Zealand after extra time in the final. Tournament favourites England go out in the quarter-finals. Wales defeat England for the first time in the 22-year history of the fixture, bringing to an end England's quest for a fourth consecutive 6 Nations Grand Slam. England's women's rugby governing body, the RFUW, establish a mirror to the existing boys' AASE (Advanced Apprenticeship in Sporting Excellence) programme at Hartpury College, Gloucestershire and Moulton College, Northamptonshire. AASE programmes are offered at RFU Academies at Guinness Premiership clubs across England. For the programme to be made available to girls is a landmark. A record number of countries bid to host the 2014 Women's World Cup. In June, Scottish Women's Rugby Union merges with the Scottish Rugby Union. 2010 Crowd of 13,253—a world record for a women's match—watches the World Cup final at Twickenham Stoop. 2011 The first IRB-sponsored women's sevens event apart from the World Cup Sevens, the IRB Women's Sevens Challenge Cup, was held in Dubai as part of the 2011 Dubai Sevens. 2012 The IRB, renamed in 2014 as World Rugby, launches the competition now known as the World Rugby Women's Sevens Series, analogous to the men's World Rugby Sevens Series. 2016 The 2016 Olympic Games in Rio included men's and women's rugby sevens—with the women's tournament being given absolute equality with the men's in terms of both player and team numbers. A new attendance record for a women's international is set, with 17,440 in attendance at Stade des Alpes in Grenoble for the France–England fixture in the 2018 Women's Six Nations. The Commonwealth Games featured a women's sevens tournament for the first time. New Zealand won the gold medal, matching the finish of their men's team at these Games. The highest profile women’s rugby tournament is the Women’s Rugby World Cup. The Women’s World Cup began in 1991, and has generally been played every four years. The most recent Women’s World Cup was held in Ireland in 2017, where New Zealand were the winners. The most successful nations in the Women’s World Cup have been New Zealand, which has won it five times, and England, which has reached the final seven times. American sevens player Valerie Griffeth. The primary annual global competition for women’s rugby sevens is the World Rugby Women’s World Series. The Women’s Series was launched in the 2012-13 season. It features 4-6 tournaments each year. Women's rugby sevens at the Hong Kong Sevens has been dominated by New Zealand, with either the New Zealand team (1999–2001) or the Aotearoa Maori team (playing as New Zealand) winning the annual tournament from 1997 until 2007. The United States won the Hong Kong Sevens in 2008 by defeating Canada in the final (New Zealand failed to send a team). The inaugural Women’s Rugby World Cup Sevens tournament took place in Dubai together with the men’s tournament in 2009. Australia defeated New Zealand 15–10 in extra-time to become the first to win the Women's Rugby World Cup. Women's rugby sevens was included in World Rugby's successful bid to reintroduce rugby to the Olympics in 2016. At the 2016 Olympics, Australia defeated New Zealand in the final to win the gold medal. Women’s rugby sevens has also been added to several regional multi-sport tournaments, including the Pan American Games in 2015 and the Commonwealth Games in 2018. ^ Else, David (2007). British language & culture (2nd ed.). Lonely Planet. p. 97. ISBN 1-86450-286-X. ^ "England v Scotland - 1881". Donmouth.co.uk. Retrieved 13 October 2016. ^ "RFU exhibition poster about Emily Valentine" (PDF). Rfu.com. Retrieved 13 October 2016. ^ Crewdson, Kay (11 February 2010). "BBC Sport - Rugby Union - Valentine was first lady of rugby". BBC News. Retrieved 13 October 2016. 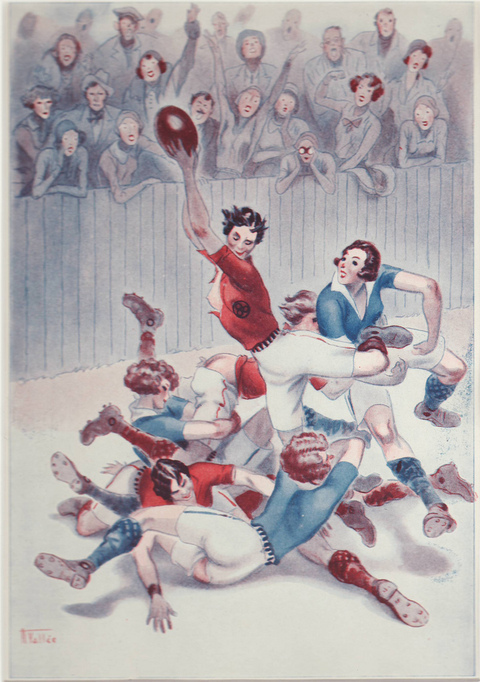 ^ Col Philip Trevor in his book Rugby Football dated 1923 opens with the chapter “The Game’s Popularity – Rugger For Girls”. His daughters who were in various stages of "flapperdom" (a 1920s term for the modern and unconventional woman) in 1913 called him to a conference. The end result being that they and a bunch of friends trooped of to a secluded beach for a game of rugger, 15-a-side with more players available if the need arose. Col Trevor who acted as referee marveled at the skills of the girls and described how they improvised with kit, by wearing bathing hats to lessen the chance of being "tackled" by the hair. Back chat and foul language was all part and parcel of rugby according to one girl who had watched the men play at Blackheath. The author queried that if they could find 30 girls in a village then how many would there be in the whole of England ? ^ Davies, D.E. (1975). Cardiff Rugby Club, History and Statistics 1876–1975. Risca: The Starling Press. pp. 70–71. ISBN 0-9504421-0-0. ^ Maria remained a keen player until she married her husband, Hector, and concentrated on bringing up eight children. She attributed her longevity to a love of rugby and an aversion to cigarettes and alcohol. Away from rugby and family duties she chaired the senior citizens club at her native Cogan for 24 years and was still calling bingo until she was 101. ^ Davies, D.E. (1975). Cardiff Rugby Club, History and Statistics 1876–1975. Risca: The Starling Press. photo plate 14. ISBN 0-9504421-0-0. ^ "Image" (JPG). 2.bp.blogspot.com. Retrieved 13 October 2016. ^ Letchworth Girls' Rugby: Women's rugby in 1928!. Letchworthgirls.blogspot.com (2008-03-03). Retrieved on 2011-05-07. ^ "Example 1, 1930" (JPG). Rugby-pioneers.blogs.com. Retrieved 13 October 2016. ^ "Example 2, late 1920s" (JPG). Static.flickr.com. Retrieved 13 October 2016. ^ ArmadilloPhoto. Iconeftp.campus-insep.com. Retrieved on 2011-05-07. ^ Wales Women: Wales Women Past & Present: The Women's Centurion. WRU (2008-03-15). Retrieved on 2011-05-07. ^ "Trémoulière strikes at the death to edge France Women home" (Press release). Six Nations Rugby. 10 March 2018. Retrieved 3 April 2018. ^ Aotearoa Maori Womens Rugby 7s. Amwr.co.nz. Retrieved on 2011-05-07. An exhibition on the history of women's rugby union, organised by the Museum of Rugby at Twickenham in 2006. Wikimedia Commons has media related to Women's rugby union. Rugbydata now includes all of results above for which a score is known making it the only rugby results website to record women's results on an equal basis to men's. Allows the user to investigate any aspect of any individual team's results.